Government-sponsored development finance institutions (DFIs) have become key delivery mechanisms for poverty alleviation and the exercise of soft power. Energy, and the power sector in particular, represents both a leading sector of bilateral DFI investment—more than manufacturing, transportation, health care, and agriculture combined—and a critical enabling sector for broader development that requires significant additional investment in the coming decades. A reformed and fully equipped U.S. DFI would directly provide billions of dollars in additional energy sector investment and would catalyze many billions more in private investment. Such an institution could also expand employment opportunities, in emerging markets and the United States, and enable broader growth. In the process, it would strengthen economic and political ties with U.S. allies and provide an alternative to Chinese infrastructure finance—an alternative that is more transparent, more deeply rooted in democratic institutions, and more market oriented. 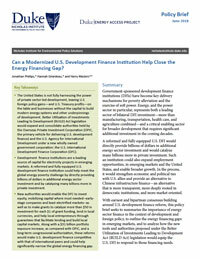 With earnest and bipartisan consensus building around U.S. development finance reform, this policy brief seeks to summarize the importance of energy sector finance in the context of development and foreign policy, to outline the energy financing gaps in emerging markets, and to analyze how the new tools and authorities proposed under the Better Utilization of Investments Leading to Development Act (BUILD Act) legislation would equip the U.S. DFI to respond to those financing needs.